When trying to encapsulate the Nashville Predators 2018-19 season, one word comes to mind: frustrating. 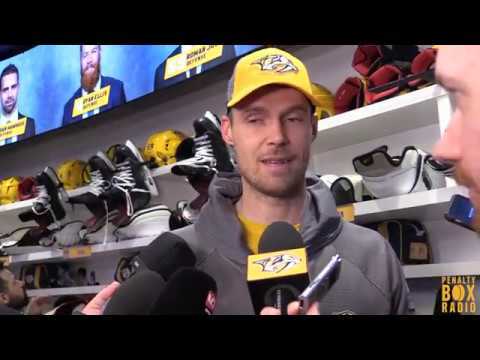 Whether it be the rash of injuries that sidelined Filip Forsberg, Viktor Arvidsson, P.K. Subban, Kyle Turris and other key members of the team, or the struggles of the 31st-ranked power play unit, the Preds and their fans have to be unsatisfied with a 31-19-4 record and second-place standing in the Central division. But if you look a little deeper, there are other stats that appear to be alarming as well. For instance, Nashville surrenders the third-fewest goals per game, but has just the 13th-ranked penalty kill. The offense does rank in the top 10 in goals per game, but are fourth in their own division in the same category – trailing the Winnipeg Jets, Colorado Avalanche and Chicago Blackhawks. But perhaps the most troubling stat is that the Nashville Predators have just a 3-6 record against division opponents in their last nine games, and just a 7-6 record against division rivals this season. That’s what makes Saturday night’s 3-1 loss to the Dallas Stars all the more difficult. What makes the loss even more disheartening is the fact the Nashville was clearly the better team for the first two periods. And outside of a five-minute window in the third period, the Preds should have won on Saturday night. Nine of the final 28 games for the Preds are against division opponents, including three of the next four games, beginning with a rematch against Dallas next Thursday. Of the next three division opponents – Dallas, St. Louis and Colorado – the Preds only have a winning record against one – Colorado. If Nashville doesn’t want to settle for a second-place finish in the Central, then the Preds will have to do better than their current 7-6 record within the division, and certainly do better than their 3-1 home loss to the Stars.